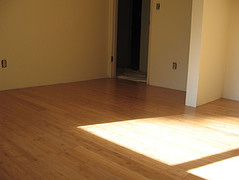 Another environmentally sound choice for flooring is bamboo. Bamboo is manufactured from processed strips of cane and compressed to be as hard and durable as a regular hardwood floor. Some bamboo is supplied in North America if the environmental impact of transportation is a concern. Kahala Floors Bamboo flooring is strand-woven and the solid choice for those seeking both "island & elegance"
Kahala Floors Bamboo flooring is available in 4 colors: Natural, Carmelized, White Washed, and in Espresso. Interlocking Boards, ideal for cost-saving floating installs. Kahala Floors Bamboo boards are 6” in length, 5” wide, and 18mm thick featuring a durable and solid wear layer. Each box contains 8 boards, weighing 80lbs per box.